The Bengals benefit from a proper call. To be or not to be … a 3 or not a 3 … a catch or not a catch. There was a play at the end of the second quarter of Sunday’s wild card game between San Diego and Cincinnati that came into question and resulted in the go-ahead field goal for the Bengals at the half. Here was the situation: Cincinnati had the ball, second-and-10 at the San Diego 41-yard line with 19 seconds left in the half with the score tied at 7. 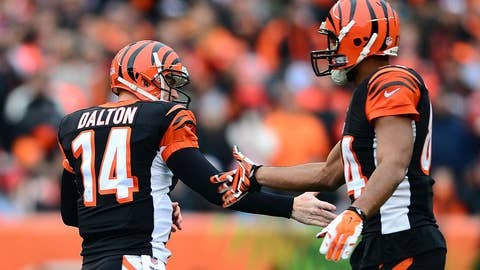 Bengals quarterback Andy Dalton completed a 13-yard pass to Jermaine Gresham, who was being defended by Jahleel Addae. Addae pushed Gresham backwards to the ground and what came into question was whether Gresham made the catch because the ball came loose as he went to the ground. After a review, it was ruled that Gresham did complete the catch. On the next play, the Bengals kicked a field goal to take a 10-7 halftime lead. It’s one of the toughest decisions that officials have to make in football today. The key on this play was that the officials ruled it a catch on the field. So they had to have something indisputable to overturn it. This was not a receiver going to the ground on his own, like the Calvin Johnson play a few years ago which many people made reference to. This was Gresham being knocked to the ground. By rule, the question then became, did he get both feet down before he was hit? Then with Addae knocking Gresham to the ground, it doesn’t make any difference if the ball comes out or not. Gresham gets that forward progress spot. The one thing the league seems to be doing consistently in the last few weeks is not overturning calls made on the field, unless it was absolutely indisputable that the call was incorrect and that wasn’t the case here. I believe they got it right. On the second part of the play, referee Jeff Triplette did an outstanding job making sure that the Bengals knew there were only two seconds left on the clock and that the clock would start on his ready for play signal. Since there was no reversal on the play to incomplete and since the original ruling was forward progress in the field of play, Triplette did as he was supposed to do to let the offense know when the clock was going to start, so they wouldn’t stand over the ball and get caught without snapping it.